Summer is here and burgers are hitting the grill. What’s the burger’s favorite side kick? Oh yeah, you got it right – the FRY. I have one amazing Rosemary Fry recipe that will knock your socks off. You’ll never want to buy one of those bags of frozen fries again. 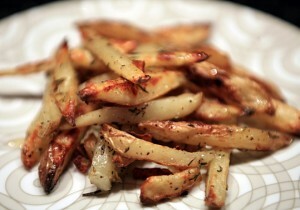 My secret to the zesty flavor of these fries is one of my favorite pantry spices: Montreal Steak Seasoning. If you haven’t used this seasoning before, here’s the perfect recipe to give it a try. I guarantee that you’ll love it at much as I do. Pair it up with some rosemary and it’s to die for. These easy-on-your wallet spices blend together to create a mouth-watering side dish that goes perfectly with those summer meals. This is one of my favorite recipes that contains both Montreal Steak seasoning and rosemary, I know you’ll love it too! Preheat oven to 500. Cut potatoes into thin wedges and place them in a bowl. Coat potatoes with a thin layer of olive oil. Sprinkle very liberally with rosemary, shallot, garlic and steak seasoning. Toss potatoes to coat evenly. Arrange in a single layer on a baking sheet. Roast for 25 minutes, until crisp and golden at edges. DO NOT OPEN THE OVEN TO CHECK ON FRIES. Let them be! When you open the oven, you release the stream and they will not be as crisp. When the pototoes come out of the oven, drizzle with honey to finish. Yum!